What an all-around amazing dog this is. The giant Newfoundland is celebrated in fable and fact. He is an exceptional water dog, using his powerful skills both as a helpmate and as a rescuer. He is equally gifted on land, pulling carts, wagons and sleds with ease. His working instincts make him the perfect all-purpose dog, as he excels on search and rescue missions, draws oohs and aahs from the audience at agility trials, or shines in the obedience ring. His gentle, sweet, willing nature makes him a natural companion dog, with an unsurpassed devotion to his family as he fulfills his role as children's companion and benevolent protector. 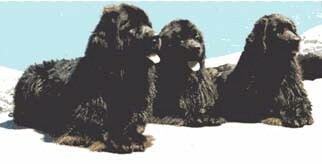 We are Judi and Ellis Adler, and we have been devoted to this one breed, the amazing Newfoundland, for over forty years. Through our Sweetbay breeding program, we have nurtured the breed's natural instincts, so that each Sweetbay dog could achieve its promise as an unequalled family dog and companion. We have taken great pride in producing the finest family Newfoundland humanly possible. Since the very beginning, we have had one goal. To produce a sound, healthy Newfoundland, with the intelligence, instinct, and sweet temperament to be a superb companion dog. In keeping with this goal, our breedings have always been well thought out, and the puppies are always home-raised. We have worked hard with our Newfoundlands. Unlike most breeding kennels, we have very few dogs of our own. This is a self-imposed requirement, so that each dog can be a cherished family companion and house dog, and each can be kept well groomed, active, and actively working. Sweetbay is a small kennel, and we deliberately produced very few litters, often only one or two a year. Each breeding was carefully planned to work toward our goal of intelligence, instinct, and soundness in mind and body. Each litter has been lovingly whelped and raised in the house. We understand and believe in the critical importance of extensive human contact and socialization, from the moment each puppy takes his first breath. This has resulted in carefully bred puppies who are raised to perfection and socialized to the max, ready to become the best of family companions in their new homes. The Newfoundland breed as a whole has many inherent health problems. Because of this, we worked hard to keep our Sweetbay Newfoundlands as trouble-free as possible. Our breeding stock has always been dysplasia free and OFA-certified. We have never made an exception. Creating and maintaining a breeding program that uses only OFA-certified stock has been difficult, but well worth the effort. Sweetbay has produced more OFA certified Newfoundlands than any kennel in history. Genetic heart problems also beset this breed, primarily sub-aortic stenosis (SAS). At Sweetbay, all dogs (both the breeding stock and the resulting puppies) have been cleared by a board certified cardiologist who worked with us since our first litter. Our breeding program greatly benefited from his supervision and advice. We worked just as hard at keeping our dogs free of the many other health issues that plague this breed. A dog must be healthy to be a life-long, active companion. Dedication to soundness is the foundation at Sweetbay. Every breeder who dedicates his life to his breed knows that one day he will have to cease producing puppies. The physical and emotional aspects require enormous stamina, effort, and strength, and no one remains young forever. We produced our final litter in December of 2013. We purposely retired from breeding while we were still at the top of our game. We knew we did not want future Sweetbay puppies to fail to reach their potential because our own abilities were no longer up to the task. We always gave every litter the best we had. Anything less was out of the question. 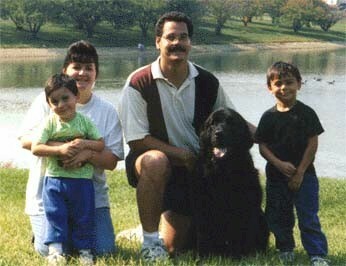 We are so proud of the families that have owned and loved Sweetbay dogs over the decades. Unlike most breeders, we spent a great deal of time (meaning months, sometimes even years) getting to know a potential Newfoundland owner before we considered placing a Sweetbay puppy with him. We always encouraged inquirers to thoroughly investigate the breed, and to investigate breeders even more carefully. An informed, educated, patient student of the breed will be more apt to make a wise purchase. His efforts will demonstrate that he has the responsibility and commitment to provide the care and guidance this special breed deserves. This restraint worked to our benefit as well. Prospective owners learned all they could about the policies and programs at Sweetbay. When they brought home a Sweetbay puppy, they had a vested interest. They understood the need to keep in touch  for it was not only a nice thing to do, it was vital to our success as breeders. And we did our best  we still do  to keep in touch with each puppy we produced and placed. Because our owners communicated with us, we could continually monitor our breeding program. We could evaluate it accurately, and then maintain, intensify, or adjust it for the best results. Keeping in touch is the only way we could be certain that each breeding produced the soundness, instincts, companionship, and temperament that has been our hallmark. Keeping in touch was also beneficial to our puppy buyers. We are always available, and always happy to answer questions or provide help or advice. Back in 1972, when we bought our first Newfoundland, we were delighted to discover that we had a very versatile dog. We were fascinated by the many clever and useful skills the breed possessed. 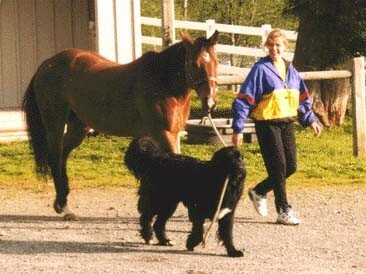 Training was fun, and that first Newf, and the ones that followed, loved to learn. In short order, our Sweetbay dogs became famous for their working talents. Today, we have produced more Newfoundlands with obedience titles than any other Newfoundland kennel. More Newfoundlands with water titles than any other kennel. More Newfoundlands with draft titles than any other kennel. 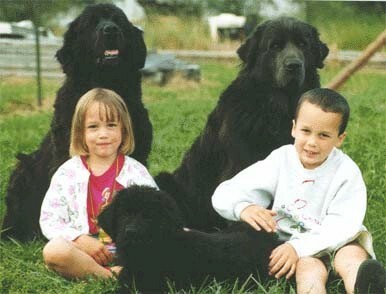 More Newfoundlands with tracking titles than any other kennel. 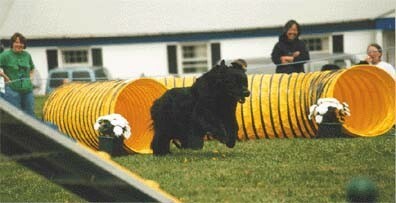 More Newfoundlands with agility titles than any other kennel. 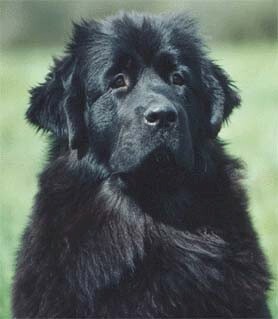 Sweetbay Newfoundlands are known for possessing brains, beauty, instinct, and soundness. This was no accident. Over the years, we enhanced the instinctive traits, the love of learning, and the willingness to work happily with man through careful breedings. But we also provided an environment that allowed the dogs to shine. We have always done our own training and handling. We also offer our training skills to others. We encouraged novice owners to take the plunge and work with the family dog, and we helped more experienced owners expand their skills and enjoyment. Although they are known for their high-profile working skills, Sweetbay dogs are more than just competitive show dogs or crackerjack working trial dogs. To give just one example, many serve as therapy and service dogs, providing a gentle presence at hospitals, institutions, and schools across the country. We believe in education, and in continuing to learn all we can about Newfoundlands. We have used that learning to refine and improve the dogs we breed. We also enjoy sharing that knowledge with others. Judi has written several books. 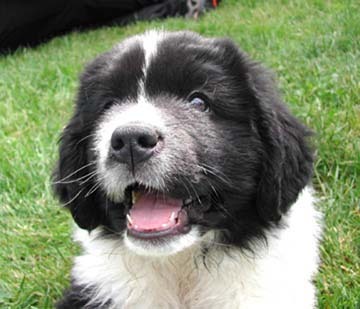 The Newfoundland Puppy: Early Care, Early Training is commonly referred to as the Bible for new owners, the one book they can't live without. It helps them get off to a great start with a new puppy, and gives them the foundation to create the dog of their dreams. Click here for more information about the Puppy Book. Water Work, Water Play shares our love of the water and water rescue training with the world. Effective and fun training techniques allow others to experience the joy of working with a Newfoundland in his natural element, the water. Click here for more information about the Water Book. The Audible Nose is a comprehensive book about tracking (the sport version of search and rescue work). Its multitude of methods and ideas will help the novice be successful, and provide new ideas and insights for the seasoned tracker as well. Click here for more information about the Tracking Book. 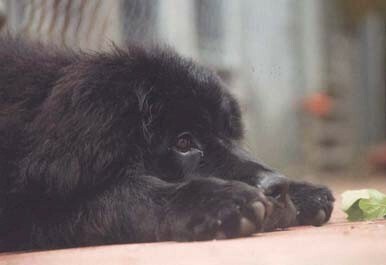 In addition, we compile and share data files that contain information on all Newfoundlands who are certified dysplasia-free by the Orthopedic Foundation for Animals. This information is an important research tool for breeders who want to improve the soundness in their own breedings. It is also a valuable tool for the prospective puppy buyer, providing accurate health data (facts, not hearsay) about breeders lines as well as data on individual dogs. The OFA Book is available at no charge on this web site. Click here for OFA information. We also share our skills through personal contacts. We have conducted wild and woolly, keep-em-busy, have-a-ball training workshops all across the country. We have taught workshops in water rescue, draft (carting), tracking, and obedience, as well as puppy training. We actively train and title our own dogs, and expect to continue those activities for years to come. We also encourage and help others to do the same. Judi also offers individualized private lessons. Whether its obedience, rally, tracking, draft or water work that interests you, she would be happy to help. 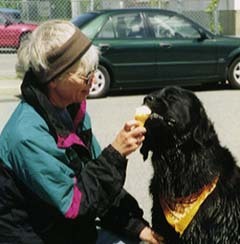 At Sweetbay, we believe that Newfoundlands should be intelligent, curious, healthy, loyal, social and sweet. Paisley, pictured here, personifies all six virtues. And many more! Well socialized puppies grow into the best of family dogs. Sarah and Ethan Brockway pose with Pawley, Gale and little Cody. Sweetbay dogs are working dogs, whether it's draft, water, tracking, or something more close to home. Here, Sherpa leads owner Debby Giard's horse to pasture. 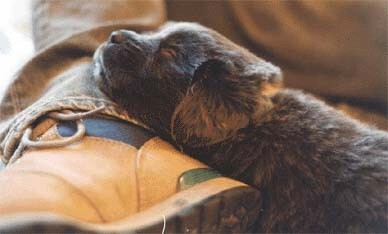 A three week old grey Sweetbay puppy finds an unusual pillow. Do you believe in love at first sight? With a Sweetbay puppy, it's impossible not to. Bryan (the guy) and Bennett (the puppy) make each other's acquaintance, at the beginning of a long and happy life together. People who think "Newfoundland" and "athlete" are opposites have never met Sweetbay dogs. Here, Ann Dunnigan's dog, Bosco, demonstrates agility work at a National Specialty. Bosco exemplifies the speed, determination, and joy that are the trademarks of Sweetbay dogs at work. Sweetbay dogs are known for their curiousity and alertness. This three month old pup is thinking about a nap, but he still keeps an eye on the activity around him. He wouldn't want to miss a party! A proper Newfoundland is first and foremost a family dog. This is Gilson and his family, the Acostas. A trip to the park, a dip in the river: life is good. At least according to Gideon, Kari and Kayla, three Sweetbay Newfoundlands. How do Newfoundlands get along with cats? Quite nicely, thank you. 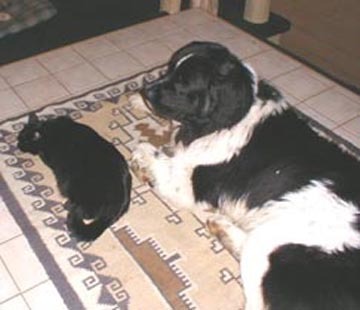 Casey (the Newfoundland) and Bandit the cat have become devoted companions, and they are seldom apart. Casey's a very active guy, but Bandit, a typical cat, believes in a more relaxed and laid-back regimen. And cats are notoriously stuck in their ways, so when Bandit settles down for a nap, Casey sighs and keeps him company. Sharing your life with a Newfoundland is a wonderful experience. Sharing an ice cream cone is pretty neat, too. Ice cream in winter, when it's darned cold outside? You bet, says Esme, as she politely consumes the cone offered by Judi Adler. Alert, social, and always up for a good time. Those words describe Sweetbay dogs perfectly. Maisie, eight weeks old, exemplifies the keen intelligence and eagerness that are present so markedly in these marvelous dogs.